Watch Bassoons Across Nebraska on YouTube. 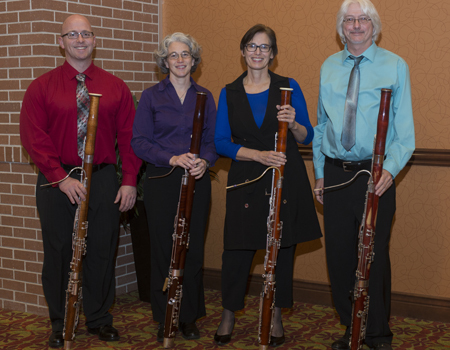 Bassoons Across Nebraska are members of the Omaha and Lincoln Symphony Orchestras, who seek to raise bassoon awareness throughout the state. These talented and versatile musicians perform music of a wide variety of styles, ranging from 17th-Century Baroque to modern pop, jazz and tangos to marches and opera. The Bassoons also perform music by Nebraska composers and have helped commission new works. Performances will be tailored to meet sponsor needs; a standard concert length is between 75 and 90 minutes (including intermission). The singular and delightful sounds of a bassoon quartet are sure to enchant your audience! As well as representing the finest bassoon playing in the region, members of the Bassoons are experienced educators, with many years of working in public schools, university settings and private studios. The Bassoons are available for small-group coachings, master classes, and hour-long in-school concerts for an additional fee of $400. As a service to instrumental music teachers in the communities, members of the Bassoons can evaluate schools’ bassoon inventories and make suggestions to help improve the quality of the instruments students have available to them.